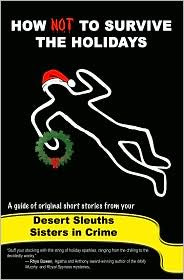 It was a perfect holiday kick-off when Authors @ The Teague presented fifteen members of the Desert Sleuth Chapter of Sisters in Crime to the Velma Teague Library. Connie Flynn and Chantelle Osman were unable to join the rest of the group, but all the rest of the authors represented in the mystery anthology, How Not to Survive the Holidays, were able to participate in the program. The original short stories were written by Deborah J. Ledford, Susan Budavari, CR (Carol) Bolinski, Merle McCann, Jean Steffens, R.K.(Roni) Olson, Judy Starbuck, Sarah Parkin, JoAnne Zeterberg, Anne Marisky, Suzanne Flaig, Mary E. Burt, Howard B. Carron, Nancy Nielson Redd, and Kris Neri. Roni Olson moderated the panel, but, first, said they were the Desert Sleuths Chapter of Sisters in Crime, a national organization. The chapter encompasses the entire state. Sisters in Crime is an organization that promotes the professional development and advancement of women crime writers to achieve equality in the industry. The anthology, How Not to Survive the Holidays, will probably be the first in a "How Not to..." series. In order to ensure that every author had the chance to speak, Roni Olson asked each of them a question. Mary Burt was asked if her story, "A Horse of Her Own," was a labor of love. She replied that she worked years and years on that story, so you could definitely call it a labor of love. Suzanne Flaig, whose story is called "The Twelve Days of Christmas," said she's a musician, so, naturally, she gravitates toward song titles for her stories. This story puts a nasty spin on the song. It's divided into twelve days, with each day a vignette as a marriage deteriorates. Since Sarah Parkin is a freelance writer, with an emphasis on travel, and local and sustainable food, she was asked how she balances genres. She replied that she finds writing fiction and nonfiction to be different processes. She can't write them on the same day. She writes more nonfiction, so more of her days are spent on nonfiction, and then she'll write fiction for two days. Deborah Ledford is the author of the novel, Staccato. She said she loves writing short stories. She writes a mystery series that takes place in one place. But, she likes to travel, and short stories enable her to use places she's been in her writing. Kris Neri is not only an author, but also the owner of The Well Red Coyote, a bookstore in Sedona. She's written numerous books and short stories. Kris said sometimes her days are so confused her head starts spinning. She's learned so much about the book business from the bookstore business that she said every writer should spend time either working in a bookstore, or taking a bookstore owner out for a drink. She's also a writing instructor, who learns as much from her students as they learn from her. Kris said she needs to find something in life that isn't book related. "Christmas Came Late" is Howard Carron's story, with a lush view of the Philippines. He was asked how he came up with that setting. According to Carron, he arrived there in the 1970s, and traveled the same route he used in the story, but, he was more comfortable than the soldiers during World War II. His story includes true circumstances with insurgent groups and the chef. It also gave him the chance to introduce and include one of his favorite subjects, the aswang, vampires. He said the editors really worked his story over. When Roni introduced Judy Starbuck, she commented that "Christmas Stalking" was one of my favorite stories. Judy was asked about her research. Judy's story is about a woman who changed identity. Starbuck was curious. How does a person leave their present life? She needed to know how to disappear. She asked the audience. "Don't you wonder if this is my real identity?" It was funny to watch Judy hold up book after book, beginning with, How to Disappear Completely. Then there was, Create a New Identity. But, she said the best book was one she found online, Cover Your Tracks Without Changing Your Identity. It had everything essential for disappearing, yet maintaining your identity. Since Roni Olson was moderating the panel, she only took a moment to mention her short story, Relativity. She said she was pleased that, in my book review, I called it a traditional mystery. She meant it to be one, in the tradition of Agatha Christie, a "closed room" mystery. Roni mentioned that Merle McCann's "Yule Night" dealt with a different holiday. McCann said her story is a period piece. In the 1895-1900 period, all kinds of people were interested in metaphysics. Since this anthology dealt with a time frame over the holidays, but, not necessarily Christmas, she thought of Yule Night because it was so important to the Victorians. They were Christians, but found ways, within their religion to blend the topics, and include metaphysics. The story is set in a household in which someone is killed. But, because of metaphysics, there are differences in beliefs. Nancy Redd's story, "The Last Resort," is set at an RV park for seniors. Redd said she's a writer of the old school, write what you know. So, all of her characters were based on people she met. She knew what the characters she created would do. But, she took a class online from Connie Flynn, creating characters with a blueprint. She learned to pick out flaws from one chart, traits from another. Knowing the flaw, she knows how a character will react. If anyone else is interested in learning to how to use a blueprint for creating characters, Flynn's class is at www.bootcampfornovelists.com. Nancy said the moral is, "You can teach old writers new tricks." Roni commented that they know CR Bolinski as Carol. Since Carol's story, "The Customer," is set in a clothing store, Olson asked her about her experience. Carol said it is based on her real experiences, and all of the craziness working in stores. Her character, despite a murder in the store, is more interested in rearranging the sale items than the death. But, the story came about because of Bolinski's anger at the lack of materials made before manufacturing moved from the U.S. Once we lost the manufacturing of materials, the materials were different. She said she has a terrible time finding 100% cotton clothing. That fact is a basis for her work in the anthology. "The Price of Diamonds," is Anne Marisky's story. Roni asked her about writing it in a male voice. Anne said it was the right point of view. Her brother once told her she could learn all she needed to know about men from watching Dirty Harry movies and spaghetti westerns, and she thinks he was basically right. Marisky said it was weird to write it, because she felt as if she was actually experiencing the story, and she was sweating when she finished. JoAnne Zeterberg's "The Gift" is set in a New Age gift store, so Roni asked about JoAnne's interest in that type of store. JoAnne replied that it's the store she would like to own. When she found she was writing a paranormal mystery, she loaned the store to her character, along with an able-bodied assistant. Roni asked Susan Budavari to give some insight into editing, with her knowledge of the business, but Susan said she would prefer to talk about her story, "The Red Journal." She said it was a new experience for her to write fiction. Budavari has a scientific background, so it's a new experience for her to let her imagination flow. But, there is a child in the story who tells his family that a treasure exists. Susan didn't feel confined to a rigid environment in writing the story, as she was with science. The family doesn't know if the child is telling the truth, but they have a pleasant surprise. Her story provides a good feeling in the mystery, in contrast to some of the darker stories in the anthology. Jean Steffens said she enjoyed writing her story, "The Night Before Christmas," because she got to put blood and guts into it. She was inspired by the story of the girl who disappeared in Aruba. And, her family was quite surprised by the blood and guts. Once the authors had a chance to introduce themselves or their stories, by way of a short answer, questions were asked by the audience, beginning with what was the process that brought about the anthology. Susan Budavari answered that she and Sue Flaig had published three anthologies before. They have a small business in Phoenix, Red Coyote Press. They knew the members of Desert Sleuths, and that there were some fabulous writers in it. They played around with the idea of an anthology, knowing it's hard for authors to get published. Budavari said she had started writing mysteries when she moved to Phoenix. She had been involved with three anthologies, and this one was the fourth one, although it was published by a different press. But, Desert Sleuths had guest speakers monthly, and some of them asked how many in the group had been published. They were authors from other chapters, and elsewhere in the country. So, Desert Sleuths formed a committee, and put out a call for manuscripts. Editors on the committee worked with three or four authors apiece. Suzanne Flaig assembled the anthology, and did the technical work. Six of the members worked on the project, and they were surprised by their efficiency. Roni Olson said they will probably do it again. They had a blind submission process. All of the manuscripts went to Jean Steffens, who didn't read them, but took the names off, and sent them on to the committee. Roni said she expects they'll have a larger number of submissions next time. Nancy commented that the guidelines said the stories had to be no more than 5,000 words, and she submitted one with 4,967. Merle was her editor. Merle commented that the editing process is a process of chipping away at the story and making it better. Tightening it is easier for someone who isn't the writer. Roni agreed, saying she had to eliminate meals from her story, because she had breakfast, lunch, and dinner. They said the next anthology will not be a Christmas one, but they haven't decided on the direction of it yet. They'll be starting the new process in January. Kris Neri said this anthology is unique because the blind submission process made it an amazing collection. Judy Starbuck said when you call for stories for an anthology, based on a theme, it's amazing to see where people's minds go. Although they all read mysteries, people don't come from the same place when writing. Flaig said, although she had trouble with the title, How Not to Survive the Holidays, they will probably continue the anthologies as a series, with "How Not to Survive" as part of the title. Their original title was 'Tis the Season, but they decided that had already been used. How Not to Survive the Holidays, contains diverse stories, everything from period pieces to the Philippines during World War II, cats, and New Year's. There's a flavor for different things happening, but they're brought together by a common theme. Merle said Jean's story is hardboiled, with a character, that could be Arnold Schwarzenegger if Hollywood was casting it. In contrast, there's Nancy's story, with elements of humor. The variety makes it a very good book. They did say some stories were rejected for the anthology. Some didn't meet the criteria. They didn't reveal how many submissions there were. But, with the blind submissions, they don't know whose stories were rejected. Howard commented that rejection is part and parcel of being a writer. You learn from rejection. When asked, they said there are 45 in the Desert Sleuths chapter, but some are from elsewhere, so there are about twenty who regularly attend the meetings. There are several thousand members of Sisters in Crime worldwide. They said a lot of the work on the book was done by the committee, and Jean. They also wanted to mention Chantelle Osman, who was out of the country. She was a key person, and did the cover of the book. Judy Starbuck said this was their first project. She said lots of other groups do anthologies. She thought it strengthened the group. They built comaraderie, and now see some possibilities for publishing in the future. They're more supportive of each other. Kris and Deborah have both had books just released, and the other members are proud and supportive. Other members of the group have never published anything. Judy is in charge of speakers for the group's monthly meetings. They bring in authors, editors, people in the publishing business, forensics. They cover the spectrum for speakers. In January, author Rhys Bowen will speak. A crime scene investigator from a police department will be the February speaker. In March, a librarian from the Phoenix Public Library, who writes under the name Lucy Lawrence, will speak. She's hilarious when she talks about what she did to get published. Judy used to have a hard time getting speakers, but now, people ask if they can speak. Desert Sleuths meets once a month, on the third Wednesday, in Scottsdale at Café Carumba. Some members have dinner at six, and the speaker is at 7 PM. They did want to mention that Howard is a member of the group. Although they are called Sisters in Crime, they adore their brothers. They like to see men in the group In fact, Simon Wood will be the speaker in June, and he will probably be the next President of the Northern California Chapter of Sisters in Crime. They also have a Write Now! conference in August. Last year, it was $70 for the conference. That included breakfast pastry, lunch, and the conference, with an amazing slate of speakers. There was a question about changing technology. Kris said, as a bookseller, and an author, authors sell certain rights to their books. So, they can sell to other sources. She said there isn't usually a big market for e-books, but it is one more place to market work. But, she said reading a novel on an i-phone is not great. But, it is one more outlet for short stories. She said people seem to want novels, nice, meaty ones. Roni commented that she thought a collection of short stories would be nice because life is so busy there often isn't time to devote to longer works. And, in an anthology, there's something for everyone, so it makes a perfect gift. If someone doesn't like a novel, it's useless. They mentioned that John Grisham's latest work is a collection of short stories, so if that's popular, others might be more successful. Howard also said short stories aren't taught in school as they used to be, so younger readers aren't used to reading them. As a librarian, when he introduces younger readers to short stories, they often come back looking for more. And, Kris said she teaches writers in UCLA's extension school. There are classes in short stories at every college, but more classes on writing novels. Kris did say there are markets out there for short stories. There are also e-zines online. But, short story markets don't pay like they used to. Carol mentioned the Chicken Soup for the Soul books. They found a niche for success in airports. People who were accustomed to buying novels, saw story anthologies. When it hit, the market took a second look at short stories. Kris Neri said she views a short story as more about the destination, and a novel is more about the journey. Roni said she had the chance to hear Peter Robinson talk about writing short stories, and he said short stories give him the opportunity to try on a different character, try a different spin. It was a fun afternoon with the Desert Sleuths authors. It was such an appropriate way to spend a December afternoon that they even offered to wrap the book as a present for those who wanted it. They ended the day by posing for a holiday photo. It was a great way to meet a number of our Arizona authors. ©2009. ISBN 9780615306650 (paperback), 218p. This sounds like a wonderful event - thanks for sharing it with us in such detail, I almost felt like I was there. How fun! I bet you all had a good time. Thanks for sharing it with us! You have been to some incredible events lately! I love the idea of the Write Now conference....nice to have more affordable conferences for writers. Oh, my gosh, I totally agree with Ingrid -- you gave us such wonderful details and vivid word pictures that I felt like I was in attendance. Thank you for sharing this with us, Lesa. I really enjoyed it. Thanks for allowing us HOW NOT TO SURVIVE THE HOLIDAYS contributors to appear, Lesa, and for sharing our remarks with your blog readers. We had a great time! And we really enjoyed meeting the enthusiastic audience members who came. Lesa, what a wonderful signing! I think I can speak for the group and say we all felt so comfortable and welcome. The audience was enthusiastic and fun. I left on a high and now can relive it by reading your thorough recap of the event. Reading Lesa's Book Critiques is like a daily dose of Chicken Soup for the Book Lovers Soul.